Sitting in the house, being warm and comfortable, I dragged myself outside to head to Windsor Park to see Linfield take on Ballinamallard United. Thankfully, it was worth it. Ballinamallard arrived at Windsor Park defending a proud 100% record at the venue, having won on both their visits last season. In fact, it was a fixture that had never been won, or even led by a home team. For the first few minutes, Ballinamallard had the better of it without dominating. The only real moment of danger for Linfield came from a long range shot. Gradually, Linfield took control of the game, and took the lead on 20 minutes when Andrew Waterworth headed home from a Billy Joe Burns. Linfield stayed in control without getting the much needed 2nd goal, going in at half-time 1-0 up. Linfield began the second-half in control again, creating chances and situations, more often than not having their crosses blocked or just fall short. At the other end, Linfield were snuffing out Ballinamallard attacks. Thankfully, the goal came, as Andrew Waterworth was put clear of the Ballinamallard defence. Even though the goal was scored by Mark McAllister, most of the credit has to go to Waterworth. He was too wide to score and had to cross it. Mark McAllister was the only player running forward into the penalty area and the pass had to be perfectly timed for him to score. It was. From there, the game was won, with substitute Matthew Tipton making it 3-0 from the penalty spot soon afterwards. One new face in the team was summer signing Mark Haughey, belatedly making a debut in the centre of defence. He didn’t have much to do, but what he did, he did well. Given the weather conditions, a scrappy 1-0 would have done for me. Very delighted with a 3-0 win, as reduces Crusaders Goal Difference advantage, and it meant Linfield went top outright after Crusaders draw today. Next on the agenda, is Monday’s Irish Cup draw. Ideally, a lower league team away at a ground i’ve never been to, or haven’t been to for a while. My hope is for Dundela, Carrick or Ards (In that order of want) away. Anyway, Irish Cup isn’t until next month. It’s all about Portadown next week. Was in Dublin last week for the Blur concert. Given the way the dates fell, I decided to make a three day week of it. While in Dublin, I was out and about (with my camera of course) to capture whatever I came across. I managed to spot some Street Art (well, quite a lot) so I went snap happy. Strange thing is, on my last two visits to Dublin in 2010 and 2011, I didn’t see much in the way of Street Art. My last visit in 2009 saw me get this fantastic piece of art. I only went in search of Street Art once. On my way back from he Blur concert, I noticed some pieces of art going through an area called Four Courts, so I made a beeline for that Luas stop on the Friday morning. Also, this weekend, is Bridge Jam in Drogheda. I’d have loved to have went but the scheduling was inconvenient. Maybe next year. 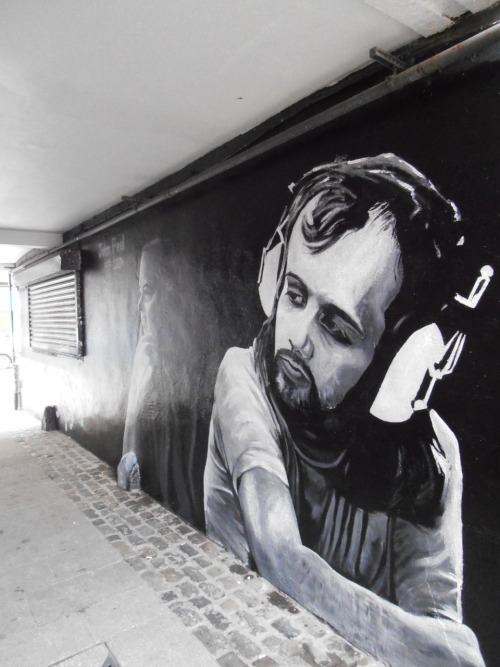 Amidst all the negative news from Belfast this past week, a new mural in tibute to former Radio 1 DJ John Peel has gone un-noticed. Alongside the images of Peel is a 45” copy of ‘Teenage Kicks‘ by Derry band The Undertones, a song famously described as Peel’s all-time favourite. The artist is Mark Ervine, a noted mural painter, who is the son of former PUP leader David Ervine. 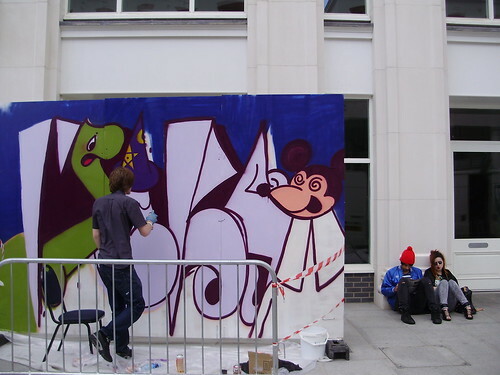 The image has been done to promote Bigg Life Arts Initiative, a charity which is being set up in the Cathedral Quarter. 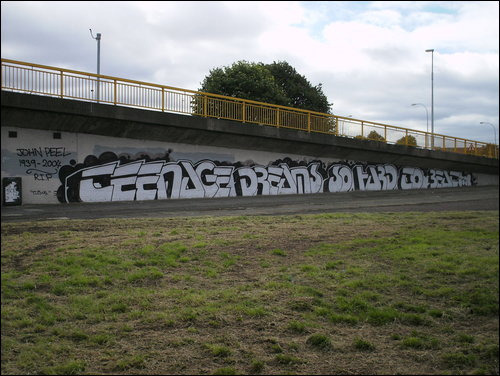 There is of course, another tribute to John Peel in Belfast, Graffiti under a bridge near Short Strand which reads “Teenage Dreams, So Hard to Beat”, lyrics from previously mentioned single ‘Teenage Kicks’ by The Undertones. 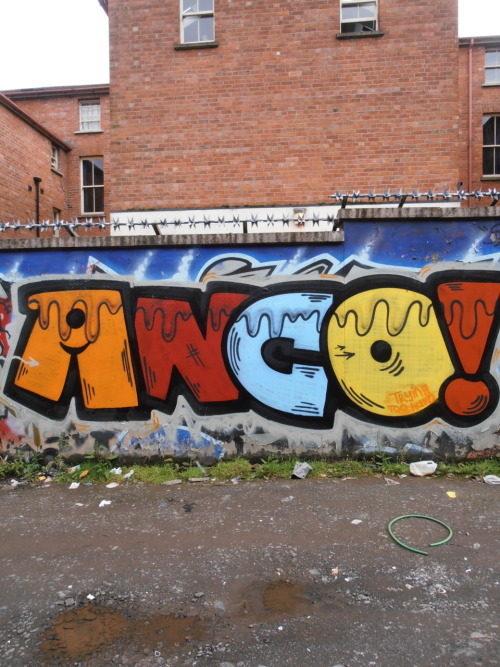 Meanwhile, I also spotted some new graffiti by ANCO, a prolific graffiti artist in Belfast. On Friday night, I was at Custom House Square to see Laura Marling perform at the Open House Festival. It was an enjoyable concert and the support acts were all excellent as well, especially, Louise and The Pins. Managed to get some photos, not the best though. They can be found here. Unfortunately, I left early as I was drenched, properly drenched. I had a free ticket, so I didn’t lose out by my early exit. The reason I had a free ticket was that I won a newspaper competition. It was the first competition i’d won in just under a year. I’d previously done quite well out of competitions. Nothing major, usually DVDs and CDs, or tickets to local concerts. The last competition I won was flights to Blackpool, but due to the inconvenience of dates, I didn’t use them. It was almost as if I was being punished by the “Competition Gods”, if such a thing exists, until this week when I won Laura Marling tickets in two publications. The second publication, I e-mailed to say I wouldn’t need the tickets now and they replied to admire my honesty, so I think i’ve kept the “Competition Gods” onside for now. Also this week, I was successful in getting tickets to see Manic Street Preachers at itunes Festival. Unfortunately, the concert is next weekend, and when window shopping for flights, saw that it would cost well over £100 just to get to London. So, I decided not to take up the option of confirming my tickets. I’d applied a long time ago in the hope that if I was successful, I would have enough notice to get a reasonably priced flight and hotel. It’s a pity as I love the Manics, they’re one of the best live acts i’ve seen. If you’re going to this concert, you’re in for a treat. Meanwhile, remember by recent blogs about how many teams that have reached a European Final that I have seen live? Currently at 28 out of 100, I might be adding Aberdeen to this list, as they face Hearts at Tynecastle when I am in Edinburgh. I’ve just booked a trip to Edinburgh in August for the third successive summer to take in the Edinburgh Fringe, which is going to be my STLFTEM for August. I’d decided to wait until the Irish League fixtures were published before booking this trip, and it turned out to be a risk worth taking as the date i’d originally hoped to go sees Linfield face Glentoran at Windsor Park, a game I would have missed. So far in the six months this year, i’ve had a STLFTEM for them, though I cheated for January, using the (re-arranged from December) game between Linfield and Glentoran. Now, I just need to have something to look forward to in July. As regular readers will know, I do enjoy the phenomenon of ‘Jalking’, where I go out with the intention of jogging, but actually end up walking. In order not to get bored, I like to change my routes and do different areas in order to keep things fresh. Last Thursday, I decided to go along the Woodstock and Cregagh Roads as I hadn’t been down there in ages. 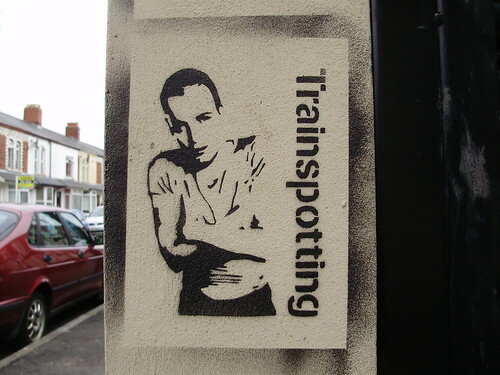 I wasn’t expecting to see anything exciting, so it was a pleasant surprise when I glanced upon a wall with various popculture figures such as Thom Yorke, Jim Morrison and Renton from Trainspotting stenciled onto the wall. I headed down this morning to have a wee look and got some photos, which are now available on Myspace and Twitpic. Meanwhile, today was the Trans Belfast Festival taking place at St Anne’s Square, an event incorporating Street Art and Music. I’d previously blogged about and enjoyed the Winter Base event. Trans is a series of various events in the city during July, which has so far successfully brought acts such as Air and DJ Shadow to Belfast for concerts. Had a wee look around and most of it was all works in progress so I can’t wait to pop along tomorrow to see the finished art. If you’re in Belfast tomorrow, why not pop along to see it as well? This week, Sky Movies are launching the ‘Batman Boxset’, where viewers can watch all Batman movies, which are being broadcast at various intervals. Eagle-eyed Batfans will notice that there is one shocking omission, the 1967 movie spin-off from the TV series. Sadly, the TV series and associated spin-offs appear to be written out of Bat-History by Warner Brothers, which is sad, as it’s the one thing I often associated when I think of the portrayals of the caped crusader. It’s a show which brings back memories from my childhood, which is probably why I love it so much. When the Tim Burton 1989 movie was released, it gave the TV show a new lease of life. For some random reason, my dad used to always record it for me, as it was on during the wee small hours, as part of ITV Nightscreen, and I would then watch it the following day after coming home from school. I used to love Chief O’Hara struggling to work out which criminal they were dealing with, despite it being so blindingly obvious. “They’ve left us a clue ……….. in the form of a joke, who could it be?” he could be found screaming at the crime scene, painfully trying to work out which criminal in Gotham City specialises in jokes, before Batman suggests that it is possibly the work of The Joker. O’Hara would then usually ask “Why didn’t I think of that?” as Batman politely ignores the opportunity to point out that it’s because he’s a complete idiot. I suppose that’s why Chief O’Hara is such an endearing character, because we all know someone like him. We’ve all work with a ‘O’Hara’, someone who has managed to get into a position of authority, despite seemingly being a halfwit who can’t even spot a problem when it is staring right in front of them. With this guy the second most senior police officer in the city, it was no surprise that Gotham City was over-run by criminals, especially with criminals being released seemingly every six weeks going by the recurring nature of the casting. To combat this, the producers began inventing characters such as Egghead, played by Vincent Price and whipping up an array of bad egg-based yokes, sorry, jokes. This wasn’t case of children copying something violent they seen on TV. It wasn’t violent you see, as made up words such as KER-POW!!! !, BIFF!!! and ZOINK!!!! would appear on screen. It might have been violence, but it was comic violence, like Stan and Ollie, especially as Batman and Robin were usually defeated by their own stupidity, but never violently. Batman’s escape was usually aided by one of the various bat-branded products in his utility belt, with Robin usually exclaiming “Holy ………”. He might have been generally useless when it came to fights, but at least he had a way with words and a “Holy ………..!!!!! !” for any occasion. Comedy was an essential part of the show, and the worse the punchline, the better. To rank alongside O’Hara’s remark about police brutality, Batman once memorably declined the offer of a VIP table in a nightclub (where he was staking out a criminal) as “He didn’t want to attract attention”, because a man dressed in tights and cape wouldn’t attract attention. Incidentally, for that scene, Robin was outside as he was too young to be in the nightclub. Despite being a masked crimefighter, Robin has to obey the laws of the land, it’s called Good Citizenship. Memorably, Batman once took time out after parking outside a villains lair to pay the parking metre despite Robin pointing out that no parking attendant would dare to give the Batmobile a parking ticket. That wasn’t the point, Batman was using the facility, and felt obliged to pay for it. After all, his money would go towards building better roads and improving the transport infrastructure in Gotham City. Thanks to a combination of Batman and Mr T, I don’t speed, I pay parking tickets, I stay in school and say no to drugs. Ahh, the power of television. The legend of Adam West lives on with his cameo appearances on Family Guy, playing himself as the O’Hara-esque Mayor of Quohog, lampooning the Bruce Wayne character in the role. An under-rated Batman movie is ‘Return To The Batcave’, where Adam West and Burt Ward player their older selves in a biopic of the TV show. West demonstrates his comic ability which made him so loved as Batman by constantly called his butler ‘Alfred’ when his name is Gerry..
After having this pointed out, West apologises, saying “Sorry Alfred” before using a switch hidden underneath a statue to open a book cabinet which revealed a pole. “A nostalgic nod to that TV show you were in Mister West?” asks Gerry, before Adam West replies, with a straight face, “No Alfred, it was part of the house when I bought it”. Some actors often battle typecasting but Adam West thrives on his fame. For many people, Adam West IS Batman, not Michael Keaton, Val Kilmer, George Clooney or Christian Bale. As Adam West asked during his Simpsons guest appearance, why doesn’t Batman dance? Where is the fun? Where is the colour? Why do the Batman movies have to be so dark? And most importantly, why do the marketing men feel the need to write Adam West and the 1960s TV show out of Bat-History? It could be best summed up, as Heath Ledger once remarked when playing The Joker, Why so serious?